Engineering With Nature. Check out the Engineering with Nature Atlas, presenting 56 nature-oriented projects that go beyond traditional engineering. Ethical Innovation in Tech. Four elements can help companies design ethical frameworks for innovation, including a new type of CEO: Chief Ethics Officer. STEM PSA. A public service advertisement featuring characters from Nickelodeon Movies’ Wonder Park aims to encourage young girls in STEM. The PSA is an extension of the Ad Council’s She Can STEM campaign. NSPE Update: News for the NSPE Community, a monthly e-newsletter. 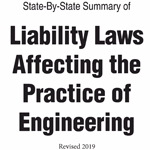 View back issues of NSPE Update. PE Scope, a bimonthly e-newsletter, updates you on the news of the profession, provides insight from thought-leaders, and connects you to interesting links and content from around the web. View back issues of PE Scope. NSPE offers free publications on a variety of engineering topics. NSPE members can choose to receive PE magazine in a digital format. Click on the following link to see a sample of the digital format. If you choose to receive the digital edition, you will receive an e-mail each time a new issue is ready along with a link to the magazine. You can change the preferred delivery method of PE Magazine on your account page. To find your account page, please login to the NSPE website. After you login, click on the "My Account" link at the top left corner of the webpage. While on your account page, on the right side of the page click on the "My PE Magazine" link in the "My Account Links" blue box. Under the "NSPE PE Magazine Preferences" page, check the preferred delivery method and click on the "Save" button. Join today and start your subscription to PE. Offering an integrated marketing platform of print, Web, e-newsletter, and conference sponsorship opportunities, PE magazine provides customized packages to reach today’s professional engineer. See our current media guide and related information. To advertise, e-mail Mark Mohanna at mark@mohanna.com or telephone him by calling 214-291-3657. Sign up to stay informed of key industry news and NSPE activities.